← Princess Kandake – Released Today! You may find fuzz in a pocket. You may find a runner in hose. are those little things in my nose. I think I was Dad’s biggest fan. Dad turns 79 this week. He’s hard to buy for, so I thought it would be nice to share this nonfiction piece he wrote almost six decades ago, which I knew nothing about until recently. It was published in the school newspaper (or journal?) when he attended Duquesne University in Pittsburgh for a couple years. How cool to learn that Dad had been published! Frequently my father asks me to take him to various parts of the city. He owns a small book store in East Liberty, and he buys much of his stock from private homes. There is a wide variety in the types of homes we enter. The worst I have ever seen was on the North Side. The house was one in a row of five. The steps were sagging, as was the porch, and everything needed paint. The front door was open so we walked in. Evidently the house was sub-divided into apartments, because in the hallway a door on the left bore the name Jones scribbled on a little card tacked to it. I glanced around the hallway while my father knocked on the door. The hall was quite long and high but very narrow. On the right wall hung several old tintype pictures, while on the left wall, in loose folds, hung the wallpaper. The one thing the walls, ceiling and floor had in common was a covering of dirt. At that moment the door was opened, and the woman we came to see peered out. My father introduced us. The woman was in her late fifties, gray-haired and enormously fat. Her cheeks were pouchy, and saliva trickled from the side of her mouth even when it was closed. She wore ancient high-topped shoes, split at the sides, and a filthy, baggy print dress that was partially covered by a filthier apron. Her front room was filled to capacity with junk. While my father was sorting out books, I looked around. The walls were covered with religious pictures, and there were wooden statues of Indians all around the room. My father finished the books and asked the woman if she had any jewelry for sale. She told him she had some stickpins in the kitchen. We started to walk through her bedroom when my father noticed another bookcase. While he was looking through this, I surveyed the bedroom. Empty, the room would have been large. But there were trunks, mattresses, tables, old clothes, and litter everywhere. Clotheslines were strung across the room, and hanging from them were old girdles, brassieres, stained sheets, and frazzled throw-rugs. I turned around and found myself looking at a giant cockroach, which was perched on an old trunk and whose feelers were waving furiously, as if daring me to come closer. I didn’t take up his dare. When my father had gone through the bookcase, we went to the kitchen. As soon as we crossed through the door, a sickening stench met us. I backed up and remained in the doorway. From my vantage point I could look into the kitchen and then, like a swimmer, turn my head and gulp fresh air from the hallway. Like the other rooms, the kitchen was filled with junk. There were four ranges–only one connected–which were piled high with old newspapers and glass jars. The wallpaper was peeling from the walls in great strips. Finally, my father finished his business and told me to get a box for the books. I saw several boxes in the hallway. I picked one up, shook out two roaches, and piled the books into it. My father paid the woman and we left the house. I think I’m still Dad’s biggest fan! I wonder how different life would have been if my father had become a writer…. This was taken on Christmas Day. 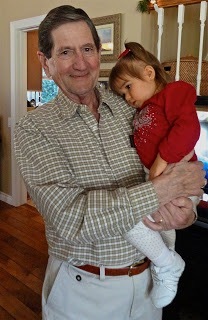 Dad’s holding great-granddaughter Twinkle Eyes. She was born on his birthday. Happy 2nd Birthday, Little Twinkle Eyes! Do you have any special interests or talents that you think genetics played a part in? Have you ever been surprised to learn something new and impressive about one of your parents? This entry was posted in family, Writing and tagged Uncategorized. Bookmark the permalink. Happy birthday to your father! That was a well-written piece. I don't think I could've stayed in that apartment more than ten seconds. Happy birthday to your dad! So special that you have that piece. Every now and then one of my parents will mention something about their past that I've never heard–that will sometimes make me have to reconsider what I really know about them. So many layers to everyone–even those that we love and think we know, right? Alex – Thank you! I couldn't have stayed in that apt. long either. Blech!April – Thanks! The details make the setting so real. Not something we'd want to read while eating!Old Kitty – Thank you! That's so cool that you appreciate the last line. I'll tell my dad!Coleen – Thanks! I was so surprised to read this after all these years. I didn't even know he went to college for a couple years. He got married at 19 and worked full-time. I guess carrying a full load at school was too much. You're right about people having so many layers to them! I guess that's what makes each person unique. Hi, Lynn,Talk about layers! Is that you and a photo of Mickey Dolenz?Your dad's reminiscence took me to that overcrowded, smelly house. He has a good eye for detail, and I found myself wondering why a woman wearing a dirty dress would tie on a diry apron. I guess that was her at-home outfit. I admire your grandfather's singlemindedness: he was on the lookout for books–and could ensure them, at least, a better life. Pat – Yes, that's a poster of Mickey Dolenz! He was my favorite Monkey. Or is it Monkee? I forgot to check the spelling! That a great point about the woman wearing a filthy apron over her dirty dress! And, yes, those books found a much better home! I was a Monkees fan too. Caught the show every Saturday morning. Great pic of Dad and Little Twinkle Eyes! And thanks for including my children's story. That's great! May your Dad have many more years! Not big on the Monkeys. I think I was just a bit too old… As for your dad's story, it's be a marvelous scene in a book. So descriptive. Stephen – Thank you! Hey, so cool that you were a monkees fan, too. And thanks for sharing your parenting story!Bish – Thank you! You're right, that would be a great scene in a book. Too bad he didn't have a passion for writing. Happy Birthday to your dad! He is a super writer, that must be where the writing gene came from Lynn. The humour comes through too. Doesn't your dad look great. Happy belated birthday to your dad.With a grandfather who was a bookseller, and a father who wrote such a vivid piece, is it any wonder you love writing? Aw, what a sweet story!! Happy birthday to them both! Golden Eagle – Thank you!Catherine – Aw, thank you! I think he looks great, too. Plays tennis 3 times a week still for two or three hours at a stretch. He's in better shape than mwah!Sarah – I never realized how my grandparents' love of books and running a book store affected me, or how my dad's silly poems (which he never wrote down) had an impact either until the past few years! Thank you!Patricia – Wow, thank you! I'm wondering what other layers there are to my folks that I don't know – and probably never will! That's funny about how the apple didn't fall far from the tree. I think that's often the case, but we don't always realize it! LOL!Nancy – Thank you! Having children is a fascinating way to figure out where your own characteristics and traits came from and what you are passing down, I wonder all the time 🙂 Thanks for signing up to do the Valentine's day bloghop, I look forward to reading your scene! This is a fascinating story, Lynn. He should have been a writer – he's got a great voice. Happy Birthday to your dad and to Twinkle Eyes. How cool is that they share a birthday! Such a lovely tribute to your dad. I agree–he's got some talent! Hoarders are such a big topic now. I only heard of them when I knew someone who ruined a relative's house about nine years ago. Your dad knew about them way before me.Happy birthday to your dad and that little girl. Hope – Thanks so much for stopping by. Yes, that's a good point about seeing traits and characteristics in our own children. It just blows my mind how some kids look so much like both parents, a beautiful combination of both! I'm looking forward to your Valentine's Day Bloghop!Angela – Your comments are always so uplifting. Thank you!Theresa – Thank you! I know, I thought the same thing about hoarders when I read Dad's piece. Crazy, huh?Robyn – Thank you! Isn't that something the both of our fathers were funny and always cracking jokes? Must be why we both have the same type of humor! And the same reason we both loved Micky! Yes, yes, yes, let's hop on that Last Train to Clarksville and be Daydream Believers! Great idea, best blogger bud!